The Buzz: 9News: Will Unaffiliated Voters Affect the Governor’s Race? 9News: Will Unaffiliated Voters Affect the Governor’s Race? Brandon Rittiman of 9KUSA and I did an interview and analysis of the potential impact of unaffiliated voters on the 2018 governor’s primary on June 26. 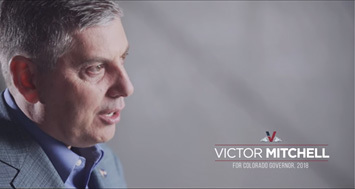 One Republican candidate, Vic Mitchell, already has an advertisement on air that points out his lack of name identity and extols it as reflecting his “non-politician” status in the race. It is an effort to appeal to Republican partisans who would like a political outsider as their nominee, but also be attractive to the thousands of unaffiliated voters who will be encouraged to participate in the primary for the first time in history. Every active unaffiliated voter will receive the ballot of both parties and can vote their preference (only one party vote allowed). Turnout for partisans in this primary should be higher because of the competitiveness in both parties and the money being spent to encourage support for particular candidates. Unaffiliated voters, who tend to vote at lower rates in general elections than partisans, will be solicited by many campaigns and have the convenience of a mail-back ballot. Voting will also have a “first time” novelty value and publicity. If a third of unaffiliated voters participated (about 40% to 50% of partisans are expected), they would vote about 2-to-1 in the Democratic primary vs. the Republican primary. In rough numbers, if 300,000 unaffiliated voters were motivated to vote, about 200,000 would vote in the Democratic primary and 100,000 in the Republican. At present, about a third of partisans say they are still undecided. That percentage would be higher among unaffiliated voters. Hence, for many unaffiliated voters there is a dual challenge for candidates to get them to vote at all and then for the candidate. Like partisans, they are divided among liberals (a growing group in Colorado), moderates (the largest group) and conservatives. Unaffiliated voters have particular barriers to politics. They don’t participate in party activities, don’t receive or pay attention to partisan communications, and often don’t even like the parties. Their lack of participation can reflect a view that politics is not that important or it’s a corrupt and corrupting business. Also, in general, they don’t know the candidates or nominating system. Both parties are going to target unaffiliated voters. Democrats may have the most incentive because recent growth in the state has leaned toward the liberal side and registered unaffiliated. The outside-type candidates will be especially active, such as Vic Mitchell and Jared Polis (who already represents many unaffiliated voters in Boulder, Larimer and Jefferson counties). "(only one party vote allowed)" is horribly unfair. I remember Scott Gessler telling me that I could vote twice, at least. I mean, what is the point of bitching about voter fraud if we don't have any? Colorado Politics: Is Denver Ready for a Change?